I have travelled several times in Alaska at different times of the year. It is a region without limits, where nature has reclaimed her rights from man. In winter, the extreme conditions freeze the landscape under an immense and silent white blanket. Only occasionally is the spell broken by the crack of a dead twig or the barks of a sled dog heard from afar. 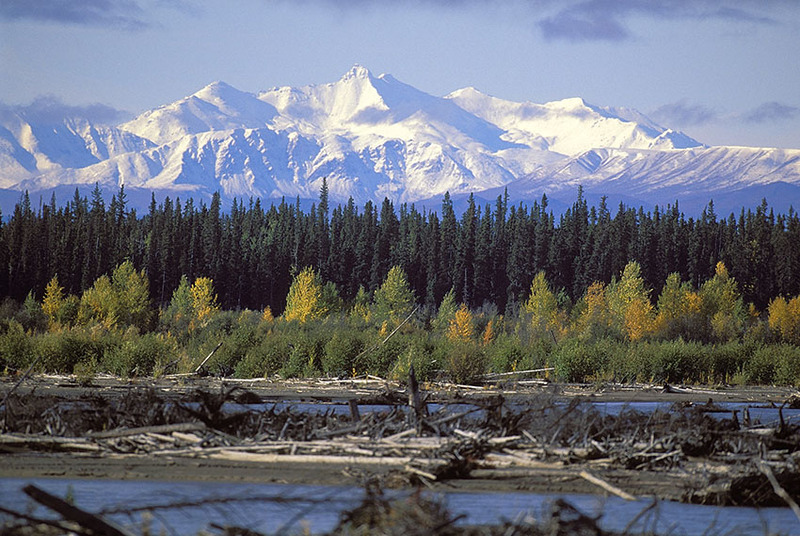 In autumn, it is the magic of the boreal regions which rules. Nature transforms herself into a veritable impressionist painting, thanks to her multicoloured vegetation. The red of the berries mixes with the orange or yellow of the leaves, with the white of the first snow on the distant peaks. At this time of year, the days start to draw in, and conditions for observing one of nature’s most extraordinary spectacles – the aurora borealis – become better and better, if solar activity allows for it. The wildlife is not at rest either. This is a time of intense activity before the harsh winter begins. For the bear, for example, that means putting on stores of fat to survive their long hibernation. A real frenzy seizes the grizzlys and black bears as soon as the salmon arrive from the Pacific to make their way upstream to spawn. It is to this even wilder spectacle I invite you to join me, in a journey of several days in a 4×4 or taxi plane, across this immense and feral part of the world which the Americans call ‘that final frontier’. It is an ideal destination to photograph landscapes and natural animal behaviours, just as much as for the traveller in search of wide open spaces and adventure.